customize this behaviour in the extension preferences or clicking the widget button and pressing the options button. 1. 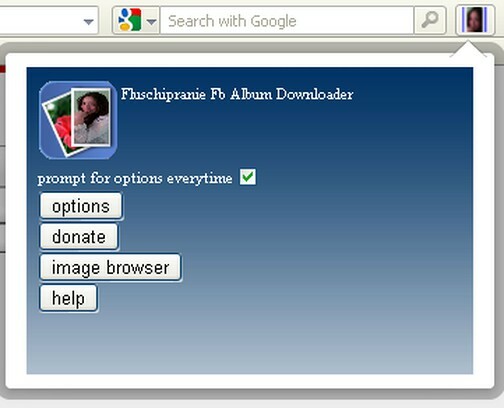 To activate or deactivate temporarily fluschipranie you must make right click on your mouse standing on a facebook page. 2. An alert with the message "Fluschipranie Activated # links" or "Fluschipranie Deactivated" should appear. Click it. button save, in that case the values set in the preferences/option file will be used. 4. You can see your albums pressing image browser in the widget panel.